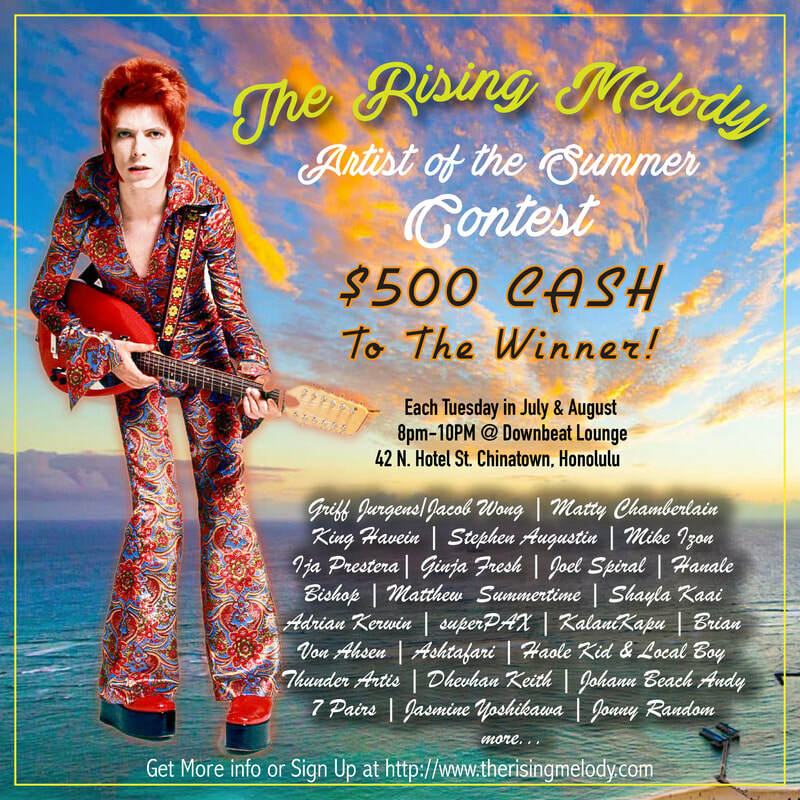 The Rising Melody Original Music Showcase at Downbeat Lounge will be giving away $500 to the performing artist who receives the most votes of support throughout the months of July and August (July 11 thru August 29)! The winner will be announced on August 29 at the end of the night. This artist showcase/contest is open to all local singer/songwriters, emcees, instrumentalists and accompaniment (18+) whom write and perform their original music. Who can vote and when can you vote? All artists, supporters, original music enthusiasts and Downbeat Lounge family and patrons (21+) who attend The Rising Melody at Downbeat Lounge event will receive one voting ballot per week upon the purchase of any food/drink item. Voting ballots will have a list of the names of all artists who are entered and in the running. Ballots are anonymous and will be placed into an anonymous box. All votes must be cast on the night the ballot was acquired. Votes will be tallied weekly and top scores will be posted. Voters may attend the event every week to vote for the same artist, or to vote for a number of different artists throughout the duration of the contest. The Rising Melody is a free event EVERY TUESDAY NIGHT, 8-11pm at Downbeat Lounge (42 N.Hotel St). $2 Tecate, Taco Tuesday Food and Drink specials and full Downbeat Diner menu with veggie and vegan alternatives are available all night long. The performance schedule posted is updated regularly. Performance slots are reserved on a first contact, first schedule basis. Artists will be contacted to confirm their scheduled performance time. All performance slots are pre-arranged. You must register and receive confirmation of your performance date and time to be entered in the running. There will always be a house acoustic guitar available for use (Biku’s Martin JC-16GTE Jumbo). All mics, amps and DI’s for accompanying instruments will be provided (as long as you let us know ahead of time via contact on this page). Artists must be on time and ready to play at least 30 minutes prior to their scheduled performance time. If an artist misses their performance time slot, they will be disqualified from the contest. All performances will be video/audio recorded, and an edited highlight clip of each artist's performance will be posted to help promote the artist throughout the contest (*unless the artist declines this option, via contact on this page). Shout outs and promotional mic opportunities will be given to all artists entered and in attendance at The Rising Melody events. For all other inquiries, please contact us via this page. Thank you.